Convolution is found ubiquitously dense in mathematics and engineering. 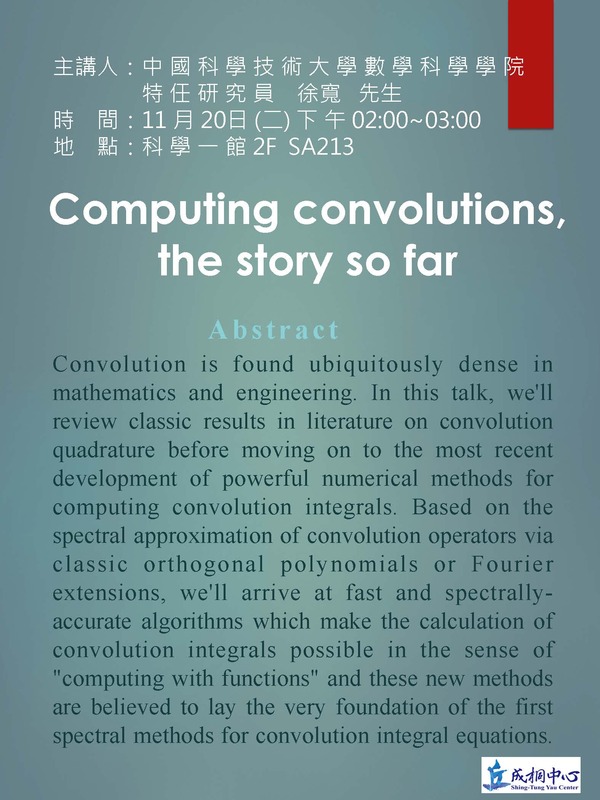 In this talk, we'll review classic results in literature on convolution quadrature before moving on to the most recent development of powerful numerical methods for computing convolution integrals. Based on the spectral approximation of convolution operators via classic orthogonal polynomials or Fourier extensions, we'll arrive at fast and spectrally-accurate algorithms which make the calculation of convolution integrals possible in the sense of &amp;amp;amp;quot;computing with functions&amp;amp;amp;quot; and these new methods are believed to lay the very foundation of the first spectral methods for convolution integral equations.